1. Test the wall switch – Sometimes there might not even be anything wrong with the opener itself, it’s simply a problem with the switch. Remove the cover on the switch and with proper protection, connect the wires that would normally be activated when you place the switch on. If it’s a faulty switch then the garage opener should activate without issue. 2. Lube the rail – It’s important to use a lubricant here that doesn’t attract dirt, and silicone spray is recommended. A lubricant used on the rail is a good idea as it ensures smooth operation of the door as it is moved. Sometimes if the door gets stuck and it seems like the issue is the opener, a simple case of removing any obstacles or dirt that sit on the rail can fix the issue. 3. Check the chain tension – Another easy fix that can be easily looked over. Making sure the chain is not too loose or too tight is important for proper functioning of the opener. Using a rule to measure the distance from the chain to the rule and making sure it’s even at all points is a good start in seeing if you have a tension issue. If there is one, simply adjust the chain length at the motor or by adjusting the rail it sits on. 4. Travel on the door – If the door happens to travel too far down time and time again, it can cause serious strain on the opener motor. By adjusting this so that it moves to the correct position, you can potentially stop a breakdown from occurring, or even fix one that has just happened. 5. Check the circuit board – This may seem like a difficult task to carry out yourself, but it’s actually quite easy. You’ll know that you’ve got a circuit board problem if there’s power to the outlet but no sound or lights are coming from the system. It’s a simple case of removing the light cover, removing the light using a screwdriver, then checking the circuit board beneath it. If you’re confident it is the root of your issue, then even removing it yourself can be an easy solution. Overall with these five quick and easy garage opener repair tips, you can save both time and money when something does happen to go wrong with your garage. If the problem is more severe, or you simply don’t feel like dealing with it yourself, then repair your door today with Girard’s same day service. 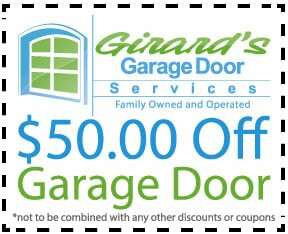 Call Girards at 610-837-4738.